Yesterday morning Invest 90L was upgraded to Subtropical Storm Alberto in the southern Gulf of Mexico. Alberto is expected to strengthen some over the next day or two and potentially obtain tropical cyclone characteristics prior to making landfall in the Gulf Coast States. While the Gulf Coast experiences tropical storm winds and heavy rain, ENC will feel the impacts of Alberto albeit in the form of heavy rain and possible flooding. 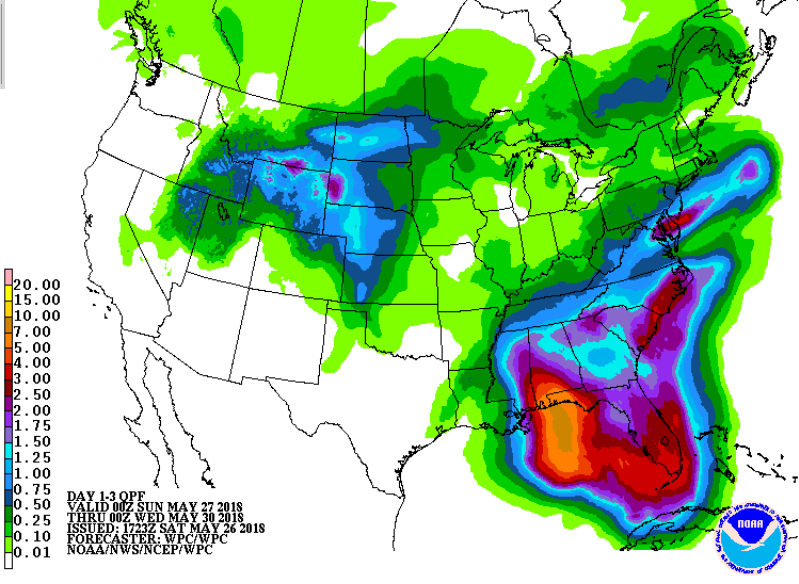 Current guidance indicates rainfall totals exceeding 2.00″ across the area with some locally higher amounts. It appears that the timing of the onset of rain has been pushed back slightly over earlier models runs with rainfall reaching the southern portions of ENC late Sunday night and move northward early Monday morning. By Monday afternoon, heavy rain will be widespread in the area with localized flooding. I will be updating through the weekend and on Monday as needed.